Today we took a Tap Tap (which is sort of like a public bus that is open with caging on all four sides. Very bumpy ride!) and went to Carrefour, where there is a home for sick and dying adults. We also went to a museum called Musée du Panthéon National Haïtien, to learn about the history and background of Haiti and its people. Towards 3:00 pm we went to an orphanage called LaLoo. Some team members mentioned that LaLoo was very eye-opening and emotional. One of the "words of the day" was giving people "comfort" in Carrefour. Most people who would see sick and dying people would stay away from them, afraid that they might get sick or because the sick person doesn't look the prettiest. Everyone on our team got close to them and that helped the sick and dying people feel so happy and loved. Some other words that were mentioned were "unconditional love" from the orphans, "serving" at Carrefour and at LaLoo, "energetic" kids, "perspective", "joyful" kids at the orphanage, "wait" on the Lord, "smiles" from everyone around us, "Kreyol", "testing" ourselves in our comfort zones, and lastly, "plans." Our plan was to bring lotion and supplies to help serve the adults, but we forgot the box with our supplies. But God's plan was for us to go anyway. A great verse that was brought up by Bob during our devotions this evening was Genesis 28:15a "I am with you, and I will protect you wherever you go." I thought this was a great verse because God gave us joy, happiness, and energy to give the children at LaLoo, and love to give the adults in Carrefour. 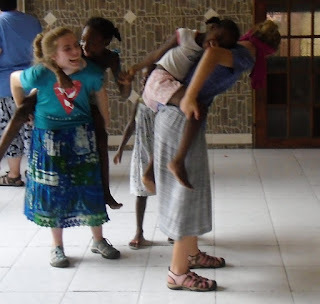 The children were constantly full of smiles and laughter. 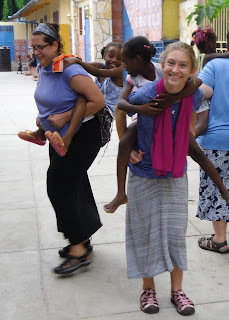 They just wanted to show us they're friendly, wanted "piggyback" rides, and mainly hugs of compassion.